Lake Bellagio Resort, located near beautiful Daylesford in Victoria, is expected to be the next “hot” tourist attraction for Victoria from 2020. With a construction budget of $100 million, this project will not only deliver a tourism win for the region, but will create up to 60 construction jobs and apprenticeships for the local area. 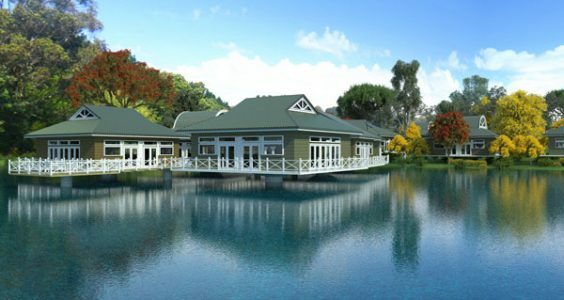 The resort will offer 100 Chalets incorporating 300 rooms, offering luxury accommodation within a lake or Australian bush setting. A Wellness Centre with Mineral Bathing, Day Spa and indoor swimming pool, offers the ultimate in pampering and relaxation. Resort guests, as well as day visitors will be able to dine in the on site restaurant and cafe, which will showcase the region’s local produce and wines. Larger groups are catered for with a 400 person reception centre suitable for celebrations such as weddings, as well as business events and conferences. When operational Lake Bellagio Resort will employ 24 people in full time and 32 in part time positions, with apprenticeships and training support through local secondary schools in catering and construction careers expected. Additionally, an estimated $34 million per year will be generated within the Hepburn Shire as more visitors will be exploring local tourist attractions, restaurants, shops and cafes.